Comprehensive review of Banana Boat Summer Color Self Tanning Lotion. See what the experts and actual users have to say about this self tanning product. Banana Boat Summer Color Self Tanning Lotion is our favorite drugstore-brand self tanner on the market today. Are there better self tanning products out there? Yes. But if you’re on a budget, this is definitely the product to buy! For a very low cost per ounce, you’ll get good color, fairly easy application, and a pleasant smell. This product may not last as long as some others out there, and may not have many extra, beneficial ingredients for your skin, but overall it works pretty well. Banana Boat Summer Color Self Tanning Lotion comes out of the tube as a medium brown lotion. It’s consistency is a little thick. This self tanner is fairly easy to apply. It’s got some tint to it which serves as a nice color guide so you’ll know where you put it. And unlike some tints out there, this one isn’t too bad when it comes to getting on your sheets and clothes. It’s medium consistency means it’s not too difficult to blend into your skin, which is good. For a drugstore tanner, this is one of the easier ones to apply. Banana Boat Summer Color Self Tanning Lotion’s drying time is about average when compared to other products. A lotion is never going to dry as fast as a spray, but lotions give you more control over where it goes. In general, less mistakes get made with lotions like this one. However, it does dry quick enough so that after about 45 minutes, you can get into bed without worrying too much about it getting all over your sheets! We’ve always liked the smell of Banana Boat’s self tanners. Most drugstore products have a terrible smell– but not this one. Very clean and fresh. This is where Banana Boat Summer Color Self Tanning Lotion doesn’t compare as well to other, more expensive brands. You’ll definitely get a bit of that “self tanner smell” that so many people want to avoid. It’s not awful, but you’ll definitely notice it. The color produced by Banana Boat Summer Color Self Tanning Lotion is a nice, fairly dark shade of bronze. For extremely light-skinned people, it may be just a touch too dark. But they do have a lighter shade you can try as well. Unlike most inexpensive self tanners, we didn’t see a lot of streakiness or splotchiness. And there was virtually no sign of “orange” that these products are notorious for. This product lasted about 3-4 days, which is average compared to most products, but better than most drugstore-type self tanners. When it faded, the results weren’t bad either. It was a little splotchy, but that’s pretty normal. Yeah, I think this one isn’t bad for guys. The smell is tolerable and the color will work well for most guys. Banana Boat Summer Color Self Tanning Lotion is a cheap self tanner. Costing around $7.00 for a 6 ounce tube, you’re looking at just over $1.25 an ounce, which is an absolute bargain. Normally we caution people to stay away from ‘cheap’ products. But this is one we can definitely feel good about recommending! 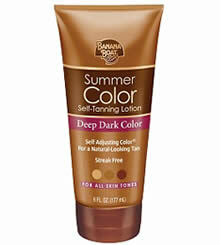 To buy Banana Boat Summer Color Self Tanning Lotion, click here. OK For Men? Medium color and light smell will appeal to many men.